This weekend was a deep stack tournament with 5000 starting chips in Casino Schenefeld. Buyin was €540, 63 starters, 2 day format. The event was very good organized but I could not get any further that 16. place (9 in the money). Still, this was enough to win me a 7-way €100 last longer sidebet and also a 2-way sidebet for a brandnew Nintendo Wii (Sebastian “miamivice” was my opponent here). No need to be sad for him, he owned the NLH cashgame thereafter and took several buyins from everybody, including me, but thats another story. The tourney was good packed with known players as Michael Keiner, Thang “evelyn” Nguyen, Katja, Dr. Jalali who just won the Master Classics in Amsterdam and several strong players more (Thang got 4th, Jalali got 2nd). Quite honestly, I don’t know what to think about Jalali. 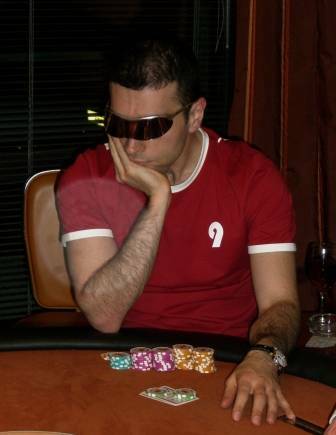 He comes across pretty friendly and is incredible successfull during the last months – still, somebody wearing “poker glasses” got to be a little suspicious, right? This was aired yesterday. Nothing unexpected. Today will see a “Spiegel TV Reportage” about Casino/Gambling, including poker and Katja.